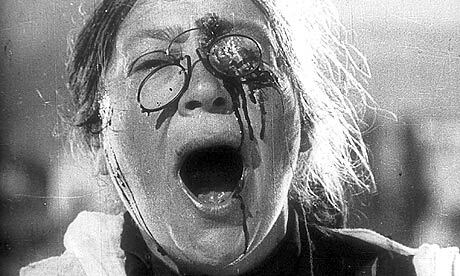 Eisenstein’s Battleship Potemkin is one of the best propaganda films of all time. 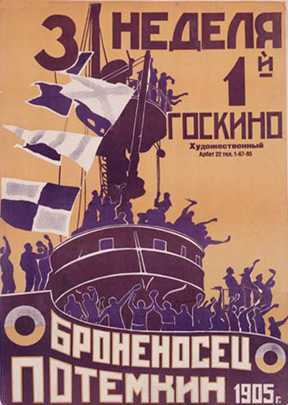 After the success of Strike (1924), the Soviet government commissioned Eisenstein to commemorate the uprising of 1905. Eisenstein used it as a testing ground for his theories of motion picture montage. The film was a shock around the world, for its graphic depictions of violence, and it raised an intense emotional response from audiences. Joseph Goebbels called the film a “marvelous film without equal in the cinema…anyone who had no firm political conviction could become a Bolshevik after seeing the film.” The famous scene of the massacre on the steps of Odessa never actually occurred but has since become one of the most iconic scenes in the history of cinema for its experimental use of montage. To retain its vivacity, Eisenstein hoped the score could be rewritten every 20 years. The film premiered at the Bolshoi Theatre in December 1925 and was released in Moscow in January 1926. Propaganda posters touted the film as “the pride of Soviet cinema” with over 300,000 admissions in the first three weeks. The setting is June 1905. Two sailors, Matyushenko and Vakulinchuk, are taken in by the revolution happening across Russia against the Tsarist regime. A clumsy officer beats a sailor for accidentally tripping over him. This causes Vakulincheck to rally the crew in support of a revolution. The men who refused to eat the meat are brought to the front of the deck and are given their last rights by an Eastern Orthodox clergyman. A blanket is thrown over them and the First Officer orders a firing squad against the men. But at the last second, with the suspense building, another sailor reminds them of their brothers. This spurs the revolution and the sailors attack the officers killing them, attacking the ship’s priest, and throwing the doctor into the ocean. The mutiny is a success, despite the death of its leader Vakulincuk. The Potemkin arrives at Odessa and Vakulincuk’s body is put on display along the shoreline to remind the people of the evils of the Tsarist regime. A sign on his shirt reads: “Dead for a spoonful of soup.” The people of Odessa gently and peacefully welcome the rebellious Potemkin as it waves a giant red flag, colored onto the film for effect. The Cossacks of the Tsar retaliate and march on the unarmed peaceful crowds. They shoot down defenseless men, women, and children in one of the most famous and recreated scenes in cinematic history. The soldiers are portrayed as inflexible, operating as one unit. The audience only ever sees their boots marching in perfect rhythm, but the crowds fall to their deaths in all manner of diverse and uncomfortable ways. The sailors on the Potemkin receive word that a Tsarist fleet is headed for the harbor to quell the rebellion. The sailors of the Potemkin decide to charge out and meet the Tsarist fleet head on. An intense buildup to their confrontation lasts what seems to the audience like an eternity – time feels extended. Incredibly, at the last minute, the Tsarist fleet announces they will join the rebellious crew of the Potemkin and together they wave the red flag. Though it is an obvious piece of Soviet propaganda, Battleship Potemkin is one of the greatest films of the 1920’s and is quite possibly the Soviet Union’s greatest silent film, alongside Vertov’s experimental Man With Movie Camera. Battleship Potemkin is an incredible film that employs new theories on montage in order to build tension and create a moving visual panorama. It is an excellent film of the highest caliber.